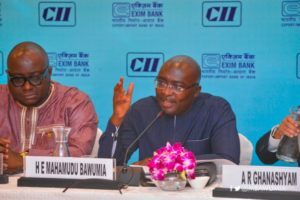 Vice President Dr. Mahamudu Bawumia has challenged his critics to provide facts and data contrary to what he has presented at the town hall meeting organised to allow him address Ghanaians on the performance of the economy. In his opening remarks at the meeting, the Vice President said his presentation was premised on facts and true data hence if anyone disagrees, the person should provide any contrary data to that effect. “Our presentation today as always is based on analysis of the data and the facts. The data will speak for itself if you disagree you should bring your own data and your record,” Dr Bawumia said in his opening comments at a Town Hall Meeting today in Accra. “Don’t disagree by saying the EMT members have big heads. You only result to insults when you are allergic to facts”. Dr. Bawumia in touting the achievements of government in the economy said, the Nana Addo led administration has managed to maintain a strong fiscal adjustment and debt management despite the current debt stock. The country’s total debt stock has increased by ¢2.9 billion in two months to reach ¢172.9 billion ending November 2018. The Data from the Central Bank showed that the new debt stock represents 57.9 per cent of the total value of Ghana’s economy otherwise referred to as Debt-to-GDP Ratio by economists. A breakdown of the debt stock shows that ¢86.3 billion of the debts were secured from outside the county, while ¢86.5 billion were domestic bonds and local borrowings. Commenting on the debt stock, the Vice President said, despite the increase, the prudent management of the economy by the NPP should not scare anyone because the current administration, has done well in maintaining discipline. He went on to state that Ghana’s economy under Mahama was vulnerable to economic shocks and said 2012-2016 was “much much worse although the environment was favourable”. The situation he lamented took Ghana to the IMF and this decision came with tough strings attached. He said through the prudent and competence management of the NPP, Ghana will officially exist the IMF. The completion which was on Wednesday March 20, made available to Ghana the cumulative amount of Special Drawing Rights (SDR) 132.84 million (about US$185.2 million). IMF in a news release last month, stated that “Considering the authorities’ resolved to tackle difficult reforms, the Executive Board also approved the authorities’ request for a waiver of the nonobservance of a few program targets.